1. Department of Radiation Oncology, Sun Yat-sen University Cancer Center, State Key Laboratory of Oncology in South China, Collaborative Innovation Center for Cancer Medicine, Canton, Guangdong Province, People's Republic of China. 2. Department of Medical Statistics and Epidemiology, School of Public Health, Sun Yat-sen University, Canton, People's Republic of China. Background: The prognostic value of C-reactive protein/albumin ratio (CRP/Alb), a novel inflammation-based marker, remains unknown in nasopharyngeal carcinoma (NPC). Methods: We conducted a retrospective review of 1572 consecutive patients with non-metastatic NPC. Patients were randomly divided into a training set (n = 514) and validation set (n = 1058). The prognostic value of the CRP/Alb ratio and the modified Glasgow prognostic score (mGPS; a well-recognized inflammation-based score) was assessed. Results: Receiver-operating characteristic analysis identified 0.05 as the optimal CRP/Alb cut-off value for disease failure in the training set. 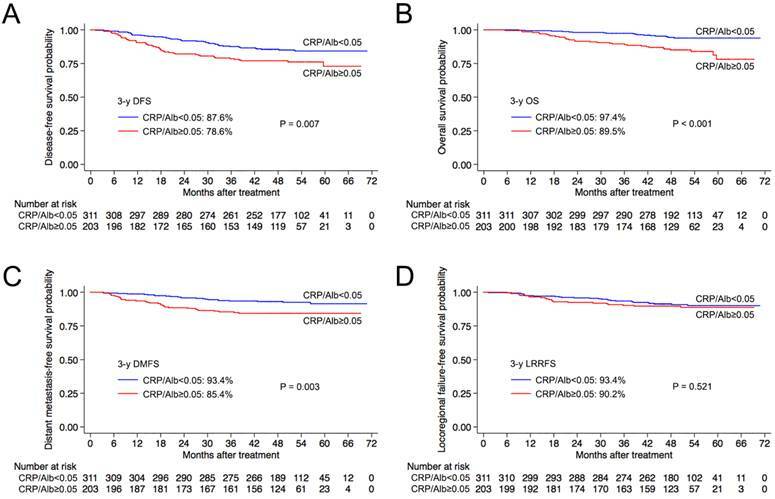 Patients with a CRP/Alb > 0.05 had poorer overall survival (OS), distant metastasis-free survival (DMFS) and disease-free survival (DFS) in the training set (all P < 0.05). These results were confirmed in the validation set (all P < 0.05) and the whole cohort (all P < 0.001). In multivariate analysis of the entire cohort, the pretreatment CRP/Alb ratio was an independent prognostic factor for OS (HR, 1.394; 95% CI, 1.004-1.937; P = 0.048) and DMFS (HR, 1.545; 95% CI, 1.124-2.122; P = 0.007), but not for DFS (P = 0.083). The mGPS had no significant independent prognostic value for any end-point. Conclusion: CRP/Alb ratio is an useful prognostic indicator in patients with NPC, independent of disease stage. Keywords: C-reactive protein, albumin, modified Glasgow prognostic score, nasopharyngeal carcinoma, prognosis. Nasopharyngeal carcinoma (NPC) is prevalent in southern China, Southeast Asia, North Africa, the Middle East and Alaska [1, 2]. Radiotherapy is the primary treatment modality for non-metastatic NPC and chemoradiotherapy is recommended for loco-regionally advanced disease [3-6]. Improvements in radiation techniques due to the wide-spread adoption of intensity-modulated radiotherapy (IMRT) instead of 2D conventional radiotherapy have significantly improved locoregional control [7-10], and distant metastasis is currently the major failure pattern in NPC [6-9, 11]. The tumor, node, metastasis staging system is currently the most reliable tool for determining clinical treatment strategies and predicting the outcome of patients. A number of other clinical factors and biological markers, including the gross tumor volume , apparent diffusion coefficient (ADC)  and lactate dehydrogenase levels (LDH) , have also been demonstrated to provide additional prognostic information in NPC. Inflammation plays an important role in carcinogenesis and tumor progression; for example, inflammation has been reported to promote tumor cell survival, proliferation, migration and invasion and also stimulate angiogenesis [15-19]. Thus, the identification of inflammation-related biomarkers has attracted much interest in oncology research. Recently, a novel inflammation-based prognostic score, the C-reactive protein/albumin ratio (CRP/Alb), was shown to have prognostic value in predicting survival in hepatocellular carcinoma . However, the prognostic value of the CRP/Alb ratio in NPC has not yet been explored. In this study, we performed a large scale cohort analysis to investigate the prognostic value of the CRP/Alb ratio in patients with NPC. We also assessed the prognostic value of the modified Glasgow prognostic score (mGPS), which is a well-recognized inflammation-based score that is also based on the levels of CRP and albumin. This retrospective study was approved by the Institutional Committee for Clinical Studies and the requirement for informed consent was waived. From November 2009 to February 2012, a total of 1572 consecutive patients with histologically-proven NPC were included in this study. The mean age of the entire cohort was 45 years (range, 14-78 years), with a male-to-female ratio of 2.9:1. All patients underwent a pretreatment evaluation including a complete patient history, physical examination, hematology and biochemistry profiles, MRI of the neck and nasopharynx, chest radiography, abdominal sonography, and a whole body bone scan using single photon emission computed tomography. Furthermore, positron emission tomography-computed tomography (PET-CT) was performed on 470/1572 (29.9%) patients. Medical records and imaging studies were analyzed retrospectively, and all patients were staged according to the 7th edition of the International Union against Cancer/American Joint Committee on Cancer (UICC/AJCC) system. The characteristics of the patients analyzed in this study are summarized in Table 1. All patients were treated with IMRT; details of the techniques used at our center have been reported previously . In total, 94.1% (1094/1572) of patients with stage III-IV NPC received concurrent chemoradiotherapy ± neoadjuvant/adjuvant chemotherapy in conjunction with a platinum-based therapeutic clinical trial. When possible, salvage treatments such as brachytherapy, neck dissection and/or chemotherapy were provided in the event of documented relapse or persistent disease. Clinicopathological characteristics of the 1572 patients with NPC. Abbreviations: NPC, nasopharyngeal carcinoma; T, tumor; N, node. a Pathologic type: according to the 2005 World Health Organization classification of tumors. b According to the 7th edition of the UICC/AJCC staging system. Statistical analyses were performed using SPSS version 22.0 (IBM Corporation, Armonk, NY, USA). The independent samples t-test was used to examine the differences in continuous variables between groups. The 1572 patients with NPC were randomly divided into a training set (n = 514) and a validation set (n = 1058). Categorical variables were compared using the Chi-square test (or Fisher's exact test, if the expected number was less than five in at least one cell). Area under the receiver-operating characteristic (ROC) curves were used to select the optimal cut-off value for the pretreatment CRP/Alb ratio in the training set by maximizing the conditional Youden score, based on the method described by Hanley and McNeil  and Zweig and Campbell . The endpoints included overall survival (OS), distant metastasis-free survival (DMFS), locoregional relapse-free survival (LRRFS) and disease-free survival (DFS). OS, DMFS and LRRFS were calculated from the first day of treatment to death, the first distant metastasis or locoregional relapse, respectively. DFS was defined as the latency to the date of disease progression or death from any cause. Actuarial rates were calculated using the Kaplan-Meier method and compared using the log-rank test. A Cox proportional hazards model was used to test the independent significance of different factors by backward elimination of insignificant variables. Host factors (age and gender), tumor factors (pathology type, T and N classification) and treatment method (radiotherapy alone vs. chemoradiotherapy) were included in all analyses. The criterion for statistical significance was set at α = 0.05 and all P-values were based on two-sided tests. The median duration of follow-up for the entire cohort was 50.0 months (range, 1.4-76.4 months). A total of 163/1572 (10.4%), 81/1572 (5.2%) and 72/1572 (4.6%) patients developed distant metastases, local relapses and regional relapses, respectively; 150/1572 (9.5%) patients died and 34/1572 (2.2%) patients experienced both distant metastases and local-regional relapses. The 3-year OS, DMFS, LRRFS and DFS rates for the entire cohort were 94.0%, 90.8%, 92.7% and 84.8%, respectively. The median and mean pretreatment CRP/Alb ratios for the entire cohort of 1572 patients with NPC were 0.036 and 0.093, respectively (range, 0.002-4.594). Patients with Stage III-IV disease had a significantly higher pretreatment CRP/Alb ratio (mean, 0.106; median, 0.043; interquartile range, 0.019-0.093) than patients with Stage I-II disease (mean, 0.057; median, 0.024; interquartile range, 0.011-0.050; P < 0.001). In the training set (n = 514), the optimal pretreatment CRP/Alb ratio cut-off value with respect to disease failure was 0.05. This value had the maximum area under the ROC curve and was used to classify the patients in the training set into the CRP/Albhigh (> 0.05) and CRP/Alblow (≤ 0.05) groups. As shown in Figure 1, The CRP/Albhigh group had significantly poorer 3-year OS (89.5% vs. 97.4%, P < 0.001), DMFS (85.4% vs. 93.4%, P = 0.003) and DFS (78.6% vs. 87.6%, P = 0.007) than the CRP/Alblow group. However, there was no significant difference in 3-year LRRFS (90.2% vs. 93.4%, P = 0.521) between the CRP/Albhigh and CRP/Alblow groups in the training set. In the validation set (n = 1058), the 3-year OS, DMFS, LRRFS and DFS rates for the CRP/Albhigh group and CRP/Alblow group were 93.4% vs. 94.2% (P = 0.031), 88.2% vs. 93.0% (P = 0.002), 92.6% vs. 93.1% (P = 0.448) and 82.4% vs. 87.0% (P = 0.012), respectively (Figure 2). Similarly, in the entire cohort (n = 1572), the CRP/Albhigh group had significantly poorer 3-year OS (92.1% vs. 95.2%, P < 0.001), DMFS (87.3% vs. 93.1%, P < 0.001) and DFS (81.1% vs. 87.2%, P < 0.001) than the CRP/Alblow group. Similarly to the training set, there was no difference in the 3-year LRRFS rates (91.8% vs. 93.2%, P = 0.315) between the CRP/Albhigh and CRP/Alblow groups in the entire cohort (Figure 3). Multivariate analysis of the entire cohort (n = 1572) was performed to adjust for confounding factors. The pretreatment CRP/Alb ratio was identified as an independent prognostic factor for OS (HR, 1.394; 95% CI, 1.004-1.937; P = 0.048) and DMFS (HR, 1.545; 95% CI, 1.124-2.425; P = 0.007), but not for DFS (HR, 1.235; 95% CI, 0.973-1.568; P = 0.083). Kaplan-Meier overall survival (A), distant metastasis-free survival (B), locoregional relapse-free survival (C) and disease-free survival (D) curves for patients with a pretreatment CRP/Alb ratio > 0.05 and ≤ 0.05 in the training set. Abbreviations: 3-y = 3-year; CRP/Alb = C-reactive protein/albumin; OS = overall survival; DMFS = distant metastasis-free survival; LRRFS = locoregional relapse-free survival; DFS = disease-free survival. 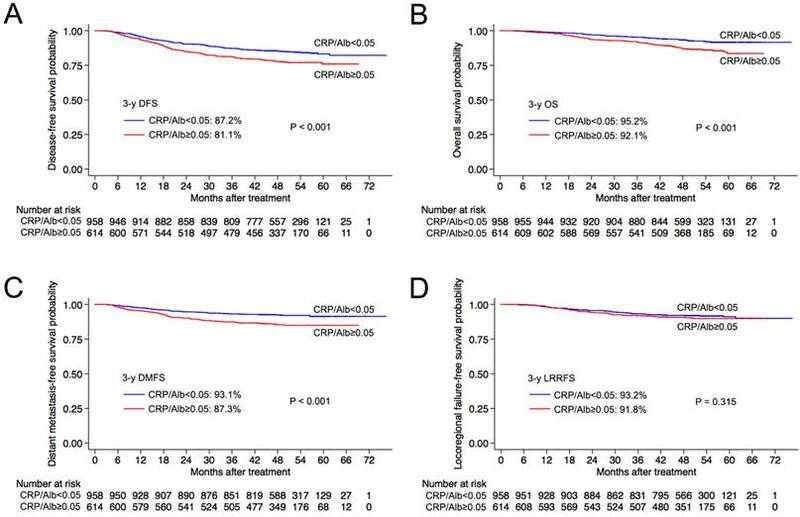 Kaplan-Meier overall survival (A), distant metastasis-free survival (B), locoregional relapse-free survival (C) and disease-free survival (D) curves for patients with a pretreatment CRP/Alb ratio > 0.05 and ≤ 0.05 in the validation set. Abbreviations: 3-y = 3-year; CRP/Alb = C-reactive protein/albumin; OS = overall survival; DMFS = distant metastasis-free survival; LRRFS = locoregional relapse-free survival; DFS = disease-free survival. 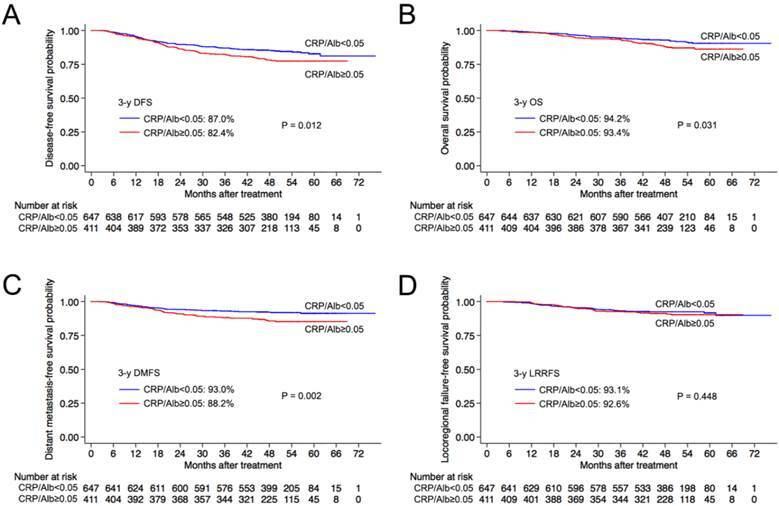 Kaplan-Meier overall survival (A), distant metastasis-free survival (B) and locoregional relapse-free survival (C) and disease-free survival (D) curves for patients with a pretreatment CRP/Alb ratio > 0.05 and ≤ 0.05 in the whole cohort. Abbreviations: 3-y = 3-year; CRP/Alb = C-reactive protein/albumin; OS = overall survival; DMFS = distant metastasis-free survival; LRRFS = locoregional relapse-free survival; DFS = disease-free survival. Based on the criteria for the mGPS, only 4/1572 (0.3%) patients had both a high CRP level (CRP > 10 mg/L) and hypoalbuminemia (albumin < 35 g/L; mGPS = 2), 122/1572 (7.8%) patients had a high CRP level but normal albumin (mGPS = 1), and the remaining 1446 (91.9%) patients had neither risk factor (mGPS = 0). In analysis of the entire cohort, the mGPS had significant prognostic value for 3-year OS (75.0% vs. 90.1% vs. 94.4%, P = 0.014), but no significant prognostic value for DMFS (75.0% vs. 85.5% vs. 91.3%, P = 0.141), LRRFS (100.0% vs. 89.8% vs. 92.6%, P = 0.565) or DFS (75.0% vs. 77.9% vs. 85.4%, P = 0.072). Multivariate analysis of the entire cohort was performed, incorporating host factors (age and gender), tumor factors (pathology type, T and N category), treatment method (radiotherapy alone vs. chemoradiotherapy), the pretreatment CRP/Alb ratio and mGPS as covariates. The CRP/Alb ratio was confirmed as an independent prognostic factor for OS and DMFS, whereas the mGPS was not significant for any of these end points (P = 0.514 and 0.789, respectively). As the first analysis of the prognostic value of the CRP/Alb ratio in NPC, this study indicates that the pretreatment CRP/Alb ratio is an independent prognostic biomarker for overall survival and distant metastasis-free survival. Inflammation is recognized to promote the initiation, progression and metastasis of cancer [15-19]. The major pathological type of NPC, undifferentiated non-keratinizing carcinoma - which accounted for 94% of the cases in this cohort - was formerly known as “lymphoepithelial carcinoma”. This pathologic type contains prominent intermixed lymphocytes within the tumor, which indicates a possible role for inflammation in the development and progression of NPC. Serum CRP and albumin are proteins associated with the acute phase of inflammation. The change in proinflammatory cytokines might be the underlying mechanism of the progonostic value of the CRP/albumin ratio. For example, IL-6, a proinflammatory cytokine, plays an important role in the up-regulation of CRP during inflammation . On the other hand, the overexpression of IL-6 was linked with lower albumin level . Moreover, studies have demonstrated that IL-6 was able to promote carcinogenesis, tumor growth, and invasion in malignancies. [27-29] As a novel inflammation-based prognostic score, the CRP/Alb ratio has been demonstrated to have prognostic value in hepatocellular carcinoma , small-cell lung cancer , esophageal squamous cell carcinoma  and gastric cancer ; the results of this study indicate that the pretreatment CRP/Alb ratio also has prognostic value in NPC. Summary of independent prognostic factors in multivariate analyses in the 1572 patients with NPC. Abbreviations: HR, hazard ratio; CI, confidence interval; OS, overall survival; DMFS, distant metastasis-free survival; DFS, disease-free survival. a P values were calculated with an adjusted Cox proportional hazards model. The mGPS is another well-recognized inflammation-based prognostic score that is also based on the levels of CRP and albumin [33, 34]. However, the mGPS did not have significant independent prognostic value for any end-point in this cohort of patients. As only four (0.3%) and 122 (7.8%) patients had a mGPS of 2 and 1, respectively, and the remaining patients (91.9%) had a mGPS of 0, the mGPS cannot adequately distinguish patients with different levels of risk in NPC. Thus, the pretreatment CRP/Alb ratio may be more suitable for identifying patients at high risk than the mGPS. This study has a number of limitations. Firstly, bias was unavoidable due to the retrospective nature of the analysis. However, the sample size was large (n = 1572) and we randomly divided the cohort into the training set (n = 514) and validation set (n = 1058). The pretreatment CRP/Alb ratio had similar prognostic value in the training set, validation set and the entire cohort. Secondly, this study only included patients treated at a single center in the endemic region. Further multi-center studies are warranted to confirm the prognostic value of the pretreatment CRP/Alb ratio in NPC. Additionally, the biological mechanisms that underlie the prognostic value of the CRP/Alb ratio in NPC are poorly understood and require further investigation. In conclusion, the pretreatment CRP/Alb ratio is a useful prognostic indicator in patients with NPC independent of disease stage, whereas the mGPS did not have independent prognostic value for any survival end-point. As assessment of both CRP and albumin are simple, routinely-available and standardized, the CRP/Alb ratio could serve as a convenient tool to improve prognostication for patients with NPC in the clinic. Future studies are warranted to investigate the mechanisms underlying the poor prognosis of patients with a high CRP/Alb ratio and develop effective interventions to improve the outcomes of these high-risk patients. This work was supported by grants from National Science & Technology Pillar Program during the Twelfth Five-year Plan Period (2014BAI09B10), Science and Technology Project of Guangzhou City, China (No. 14570006), the Planned Science and Technology Project of Guangdong Province (No. 2013B020400004) and Health & Medical Collaborative Innovation Project of Guangzhou City, China (201400000001). Corresponding author: Prof. Jun Ma, M.D., Department of Radiation Oncology, Sun Yat-sen University Cancer Center, 651 Dongfeng Road East, Canton 510060, People's Republic of China. Telephone: +86-20-87343469 Fax: +86-20-87343295 E-mail: majun2sysu.edu.cn.